Canada Day weekend unofficially marks the beginning of summer (well that and Grand Prix weekend). One of the things that officially makes it summer is lobster salad. 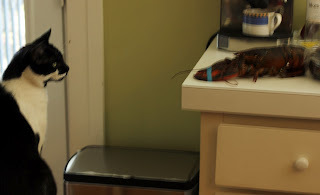 Max has never been quite fond of live lobsters in the house (maybe something in a past life, I'm not sure), but he's always a little careful. 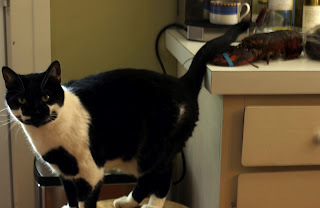 Either he's getting comfortable with them, or he kinda forgot they were there. Good thing there is a band on his claw.